The Blurb: Cutter is a bad man with a thriving business empire and a sideline in pimping out youngsters. Livvy is a naive young girl trying to help out her family in austerity Britain. Jack just wants to protect his sister... The Best of British collection is an ongoing series of novellas set in the grimy underbelly of our fine country that is designed to highlight both the social realisms and the writing talent that is out there today. We're proud to add Julie Morrigan to this collection and know you'll admire her as much as we do. Dark Voices by Darren Sant. The Blurb: Dark Voices is a collection of fifteen stories from Darren Sant. Revenge is one of the most powerful motivating forces we can experience. A wild justice that seeks no counsel or consults no jury. A man walks the streets on a rainy night with just one sinister goal in mind. A cynical hard drinking rock journalist has a surprise in store back stage at a gig. An arranged rendezvous in a smoky dive on the wrong side of town. A man awakes to find he is bound to a chair and with no idea why. Two bitter rivals in a show down in a New Orleans alleyway. Two old guys meet in a pub but is all as innocent as it seems to onlookers? Many of the stories in this collection centre around the concept of revenge, and many are crime fiction - but it's not all blood and guts, as Darren Sant takes a humorous sideways glance at life in one or two stories. The Blurb: When the Stanton brothers decide to rob Teesside construction magnate, drug dealer, and all-round scumbag, Terry Albright, they think it’s going to be easy. Get in, get out, break a few bones, and make a tidy profit. But when the money isn’t where it’s supposed to be, they find themselves holed-up in a high-rise flat trying to break into the bedroom of a fat, Eminem wannabe, while surrounded by a family of psychotic scrap dealers and bone breakers who want the money for themselves. But as the night wears on, and the Stantons realise that time isn’t on their side, they decide to take matters into their own hands, leading to a hammer wielding, classic car smashing, bone-breaking finale. Bone Breakers is a crime thriller with the emphasis on thrills. It screams along at a furious pace, mixing fast action, ultra-violence, black comedy, snappy dialogue, and the Stanton brothers at their bickering, foul-mouthed best. The Blurb: When the simple task of collecting a briefcase from a Northern courier in his London lock-up results in a dead Geordie gangster there's only one thing that Kenny Rogan can do...dress up in drag and rob a jewellers with 'Big' Jim and hope everything turns out okay! 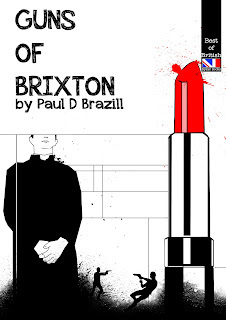 "Sharp as a stiletto in a back alley, this is a muscular, outstanding London gangster novel told in a cockney accent. Brazill has caught both the feel of London's underworld and its flavour. Like the offspring of a wild night out between The Stranglers and The Clash this pounds with music, contemporary cultural references and a real feel for the city. Funny, dark, vernacular and savage this novel leads you to a set of punches that would knock out a heavyweight and appropriately they're not delivered according to the Queensberry rules." Richard Godwin author of One Lost Summer, Apostle Rising and Mr Glamour. "Strap yourself in for a violent and funny ride full of thrills, spills and kills. It's Brazill at his irrepressible best." Nick Quantrill author of Broken Dreams, The Late Greats & Bang, Bang, You're Dead! "Charlie Williams meets Pulp Fiction." Ian Ayris, author of Abide with Me and A Day In The Life Of Jason Dean.